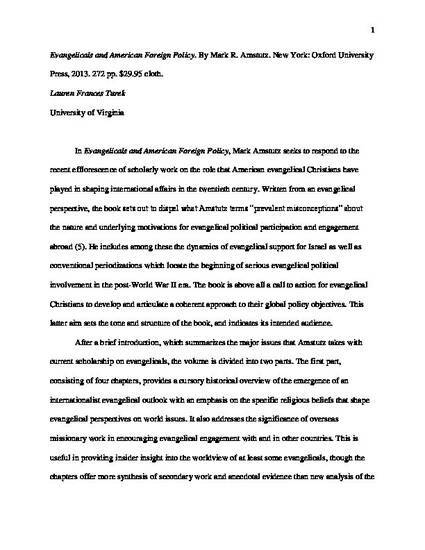 In Evangelicals and American Foreign Policy, Mark Amstutz seeks to respond to the recent efflorescence of scholarly work on the role that American evangelical Christians have played in shaping international affairs in the 20th century. Written from an evangelical perspective, the book sets out to dispel what Amstutz terms “prevalent misconceptions” about the nature and underlying motivations for evangelical political participation and engagement abroad (5). He includes among these the dynamics of evangelical support for Israel as well as conventional periodization that locate the beginning of serious evangelical political involvement in the post-World War II era. The book is above all a call to action for evangelical Christians to develop and articulate a coherent approach to their global policy objectives. This latter aim sets the tone and structure of the book, and indicates its intended audience.